On July 12, with Apollo 11 still on the launch pad, Hornet departed Pearl Harbor for the recovery area in the central Pacific, in the vicinity of 10°36′N 172°24′E﻿ / ﻿10.600°N 172.400°E. A presidential party consisting of Nixon, Borman, Secretary of State William P. Rogers and National Security Advisor Henry Kissinger flew to Johnston Atoll on Air Force One, then to the command ship USS Arlington in Marine One. After a night on board, they would fly to Hornet in Marine One for a few hours of ceremonies. On arrival aboard Hornet, the party was greeted by the Commander-in-Chief, Pacific Command (CINCPAC), Admiral John S. McCain Jr., and NASA Administrator Thomas O. Paine, who flew to Hornet from Pago Pago in one of Hornet's carrier onboard delivery aircraft. Before dawn on July 24, Hornet launched four Sea King helicopters and three Grumman E-1 Tracers. Two of the E-1s were designated as "air boss" while the third acted as a communications relay aircraft. Two of the Sea Kings carried divers and recovery equipment. The third carried photographic equipment, and the fourth carried the decontamination swimmer and the flight surgeon. At 16:44 UTC (05:44 local time) Columbia's drogue parachutes were deployed. This was observed by the helicopters. Seven minutes later Columbia struck the water forcefully 2,660 km (1,440 nmi) east of Wake Island, 380 km (210 nmi) south of Johnston Atoll, and 24 km (13 nmi) from Hornet, at 13°19′N 169°9′W﻿ / ﻿13.317°N 169.150°W. During splashdown, Columbia landed upside down but was righted within ten minutes by flotation bags activated by the astronauts. A diver from the Navy helicopter hovering above attached a sea anchor to prevent it from drifting. More divers attached flotation collars to stabilize the module and positioned rafts for astronaut extraction. The Passive Seismic Experiment ran until the command uplink failed on August 25, 1969. The downlink failed on December 14, 1969. As of 2018, the Lunar Laser Ranging experiment remains operational. Aldrin is a tiny impact crater located on the southern part of the Mare Tranquillitatis, to the east of Sabine. It is located about 50 kilometers to the northwest of the Apollo 11 landing site. Named after Buzz Aldrin, the crater is the westernmost of a row of three craters named in honor of the Apollo 11 crew members. About 30 kilometers to the east is the landing site of the Surveyor 5 lunar probe. This crater was previously identified as Sabine B before being named by the IAU. Sabine itself is to the west of Aldrin. The Apollo 11 Cave is an archeological site in the ǁKaras Region of south-western Namibia, approximately 250 km (160 mi) southwest of Keetmanshoop. The name given to the surrounding area and presumably the cave by the Nama people was “Goachanas”. However, the cave was given its name by German archaeologist Wolfgang Erich Wendt who was working in the cave when he heard of the Apollo 11 crew's successful return to Earth on July 24, 1969. The Apollo 11 goodwill messages are statements from leaders of 73 countries around the world on a disc about the size of a 50-cent piece made of silicon that was left on the Moon by the Apollo 11 astronauts. The disc also carried names of the leadership of the Congress, the four committees of the House and Senate responsible for legislation related to the National Aeronautics and Space Administration (NASA), and NASA's top management, including past administrators and deputy administrators. At the top of the disc is the inscription: "Goodwill messages from around the world brought to the Moon by the astronauts of Apollo 11." Around the rim is the statement: "From Planet Earth -- July 1969". The disc was manufactured by Sprague Electric Company of North Adams, Massachusetts. NASA head Thomas O. Paine proposed the idea to the U.S. State Department, and corresponded with world leaders to solicit their messages. These were enshrined by being photographed and reduced to 1/200 scale ultra microfiche silicon etching. The disc rests in an aluminum case on the Moon's Sea of Tranquility. The Apollo 11 lunar sample display is a commemorative podium style plaque display consisting of four rice-size dust particle specimens (dubbed "Moon rocks"), the recipient's flag and two small metal plates attached with descriptive messages. The Apollo 11 podium style commemorative wooden plaque displays were given out as gifts in 1970 by President Richard Nixon to 135 countries worldwide, the 50 states of the United States and its territories. Collins is a tiny lunar impact crater located on the southern part of the Mare Tranquillitatis. It is located about 25 kilometers to the north of the Apollo 11 landing site. Named after American astronaut Michael Collins, the crater is the central member of the row of three craters named in honor of the Apollo 11 crew members. About 15 kilometers to the west-northwest is the landing site of the Surveyor 5 lunar probe. This crater was previously identified as Sabine D before being renamed by the IAU. Sabine itself is to the west of Collins. Corby is a crater approximately 6.6 km in diameter on the planet Mars, located at 42.88°N 137.56°E. The crater was named after the town of Corby, Northamptonshire, England, referred to in an Apollo 11 conversation. This is a partial list of artificial materials left on the Moon. The table below does not separately list lesser artifical objects such as retroreflectors, Apollo Lunar Surface Experiment Packages, or the commemorative, artistic, and personal objects left there by Apollo astronauts, such as the US flags, commemorative plaques attached to the ladders of the Apollo Lunar Modules, the silver astronaut pin left by Alan Bean in honor of Clifton C. Williams whom he replaced, the Bible left by David Scott, the Fallen Astronaut statuette and memorial plaque left by the crew of Apollo 15, the Apollo 11 goodwill messages disc, and the golf balls Alan Shepard hit during an Apollo 14 moonwalk. The remains of five S-IVB third stages of Saturn V rockets from the Apollo program are the heaviest single pieces sent to the lunar surface. Humans have left over 187,400 kilograms (413,100 lb) of material on the Moon, and 380 kilograms (838 lb) of Moon rock was brought back to Earth by Apollo and Luna missions. The only artificial objects on the Moon that are still in use are the retroreflectors for the lunar laser ranging experiments left there by the Apollo 11, 14, and 15 astronauts and by the Lunokhod 1 and Lunokhod 2 missions.Objects at greater than 90 degrees east or west are on the far side of the Moon, including Ranger 4, Lunar Orbiter 1, Lunar Orbiter 2 and Lunar Orbiter 3. The Lunar plaques are stainless steel commemorative plaques measuring 9 by 7 5⁄8 inches (22.9 by 19.4 cm) attached to the ladders on the descent stages of the United States Apollo Lunar Modules flown on lunar landing missions Apollo 11 through Apollo 17, to be left permanently on the lunar surface. The plaques were originally suggested and designed by NASA's head of technical services Jack Kinzler, who oversaw their production.All of the plaques bear facsimiles of the participating astronauts' signatures. For this reason, an extra plaque had to be made for Apollo 13 due to the late replacement of one crew member. The first (Apollo 11) and last (Apollo 17) plaques bear a facsimile of the signature of Richard Nixon, President of the United States during the landings, along with references to the start and completion of "man's first explorations of the Moon" and expressions of peace "for all mankind". The Lunar sample displays are two commemorative plaques consisting of small fragments of Moon specimen brought back with the Apollo 11 and Apollo 17 lunar missions and given in the 1970s to the people of 135 countries worldwide, the 50 states of the United States and its overseas territories by United States President Richard Nixon as goodwill gifts. This Mare has a slight bluish tint relative to the rest of the Moon and stands out quite well when color is processed and extracted from multiple photographs. The color is likely due to higher metal content in the basaltic soil or rocks.Unlike many other maria, there is no mass concentration (mascon), or gravitational high, in the center of Mare Tranquillitatis. Mascons were identified in the center of other maria (such as Serenitatis or Imbrium) from Doppler tracking of the five Lunar Orbiter spacecraft in 1968. The gravity field was mapped at higher resolution with later orbiters such as Lunar Prospector and GRAIL, which unveiled an irregular pattern. Michael Collins (born October 31, 1930) is an American former astronaut, test pilot, and retired major general of the United States Air Force Reserves. Selected as part of the third group of fourteen astronauts in 1963, he flew into space twice. His first spaceflight was on Gemini 10, in which he and Command Pilot John Young performed orbital rendezvous with two different spacecraft and undertook two extravehicular activities (EVAs, also known as spacewalks). His second spaceflight was as the Command Module Pilot for Apollo 11. While he stayed in orbit around the Moon, Neil Armstrong and Buzz Aldrin left in the Apollo Lunar Module to make the first crewed landing on its surface. He is one of 24 people to have flown to the Moon. Collins was the seventeenth American in space, the fourth person (and third American) to perform a spacewalk, and the first person to have performed more than one spacewalk. Prior to becoming an astronaut, he graduated from the United States Military Academy, and from there he joined the United States Air Force and flew F-86 Sabre fighters at Chambley-Bussieres Air Base. He was accepted into the U.S. Air Force Experimental Flight Test Pilot School at Edwards Air Force Base in 1960. He unsuccessfully applied for the second astronaut group, but was accepted for the third. After retiring from NASA in 1970, Collins took a job in the Department of State as Assistant Secretary of State for Public Affairs. A year later, he became the director of the National Air and Space Museum and held this position until 1978, when he stepped down to become undersecretary of the Smithsonian Institution. In 1980, he took a job as vice president of LTV Aerospace. Collins resigned in 1985 to start his own consulting firm. Moon landing conspiracy theories claim that some or all elements of the Apollo program and the associated Moon landings were hoaxes staged by NASA, possibly with the aid of other organizations. The most notable claim is that the six manned landings (1969–72) were faked and that 12 Apollo astronauts did not actually walk on the Moon. Various groups and individuals have made claims since the mid-1970s that NASA and others knowingly misled the public into believing the landings happened, by manufacturing, tampering with, or destroying evidence including photos, telemetry tapes, radio and TV transmissions, Moon rock samples, and even killing some key witnesses.Much third-party evidence for the landings exists, and detailed rebuttals to the hoax claims have been made. 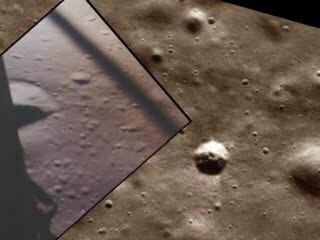 Since the late 2000s, high-definition photos taken by the Lunar Reconnaissance Orbiter (LRO) of the Apollo landing sites have captured the lander modules and the tracks left by the astronauts. In 2012, images were released showing five of the six Apollo missions' American flags erected on the Moon still standing; the exception is that of Apollo 11, which has lain on the lunar surface since being accidentally blown over by the takeoff rocket's exhaust.Conspiracists have managed to sustain public interest in their theories for more than 40 years, despite the rebuttals and third-party evidence. Opinion polls taken in various locations have shown that between 6% and 20% of Americans, 25% of Britons, and 28% of Russians surveyed believe that the manned landings were faked. Even as late as 2001, the Fox television network documentary Conspiracy Theory: Did We Land on the Moon? claimed NASA faked the first landing in 1969 to win the Space Race. The Susan B. Anthony dollar is a United States dollar coin minted from 1979 to 1981, when production was suspended due to poor public acceptance, and then again in 1999. Intended as a replacement for the unpopular and cumbersome Eisenhower dollar, the new smaller one dollar coin went through testing of several shapes and compositions, but all were opposed by the vending machine industry, a powerful lobby affecting coin legislation. Finally, a round planchet with an eleven-sided inner border was chosen for the smaller dollar. The original design for the smaller dollar coin depicted an allegorical representation of Liberty on the obverse, but organizations and individuals in Congress called for the coin to depict a real woman. Several proposals were submitted, and social reformer Susan B. Anthony was selected as the design subject, much to the disappointment of most numismatists who preferred the original classic Liberty-head design. The reverse design of the Eisenhower dollar was retained, an engraving of the Apollo 11 mission insignia showing an eagle landing on the Moon. Both sides of the coin, as well as the rejected Liberty design, were created by Frank Gasparro, the Chief Engraver of the United States Mint. One half billion coins were struck in anticipation of considerable public demand, but the Anthony dollar was poorly received, in part because of confusion caused by its similarity in size and metallic composition to the quarter. Despite its poor reception, the coins eventually began seeing use in vending machines and mass transit systems, depleting the surplus by the late 1990s. In 1997, Congress passed a law authorizing the mintage of a new gold-colored one-dollar coin depicting Sacagawea, but production could not begin quickly enough to meet demand. Until the new Sacagawea dollar coin could be issued, the Anthony dollar was struck again in 1999 as a stopgap measure after an eighteen year hiatus; the series was retired the following year. Special coins for sale to collectors were struck in proof finish through the run of the Susan B. Anthony dollar, and some minting variations are valuable to collectors. However, most circulation strikes remained in government stockpiles for several years after minting, so many of the coins are available in uncirculated grades, and the premium over face value is minimal.